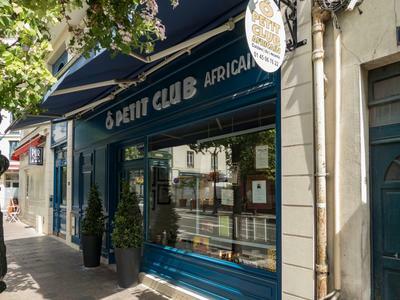 The restaurant Ô Petit Club Africain offers African cuisine and ambiance in the western Paris suburb of Puteaux. Chef Raoul Dufy has regaled customers here for the past five years. 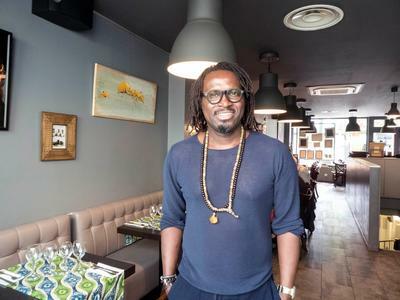 Born in Senegal, he learned to love cooking in his mother’s kitchen and studied the culinary arts at the Ecole Ferrandi in Paris. After working in several prestigious kitchens in France, he opened Ô Petit Club Africain in 2012. On the day Tom and I lunched there, we were the first customers to arrive for lunch. We got our pick of the tables and settled upon a place on the spacious, bright, and well-ventilated terrace at the rear of the restaurant. Original art works and crafts enlivened the space and music from Africa played over the sound system. 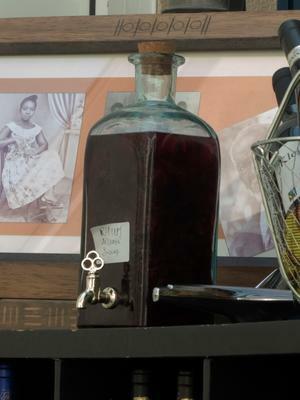 A bottle of bissap-flavored rhum arrangé, complete with what must have been hundreds of rum-steeped hibiscus flower petals, beckoned to be sampled. Our server informed me that the restaurant had several other flavored rums to choose from, but I stuck with my original selection and ordered the bissap variety as an apéritif. It was more potent than I expected and because I’ve been conditioned by drinking bissap juice, it was not as sweet as I thought it would be. I will try another variety next time. Tom ordered an apéritif-sized portion of pastels and received three tender, piping hot fish and parsley fritters in a tangy red sauce. He forewent an alcoholic beverage and ordered a glass of jus de bouille (baobob juice) instead. He described this cloudy, camel-colored drink as being slightly grainy and having a faint banana flavor. 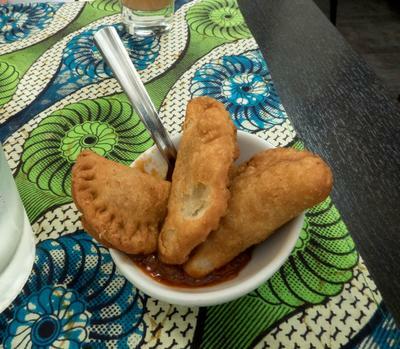 The menu consists of four entrées, three salads, eight main dishes, six desserts, and a whopping fourteen (14) selections of artisanal ice creams and three sorbets. 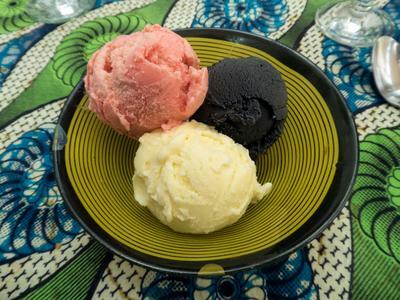 The ice creams are made locally by Nicolas Poilevey. Non-alcoholic beverages included natural juices of tamarind, bissap, ginger, and the bouille mentioned above. I did not order an entrée for fear of being too full upon leaving the restaurant. 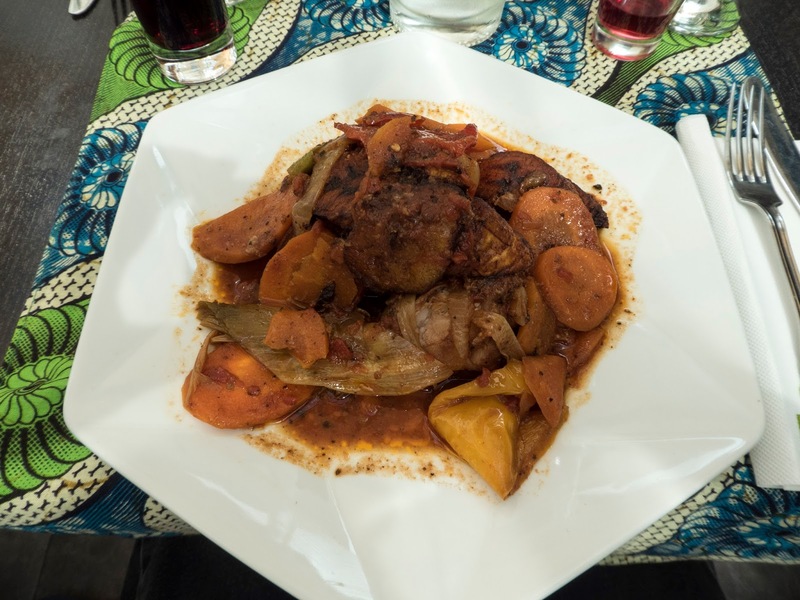 For my main course, I selected Poulet DG, a traditional Cameroonian chicken-and-vegetable stew served with plantains. I received a plate piled high with a tender chicken leg topped with sliced carrots, red and yellow bell peppers, sliced spring onions, and steamed plantains. The chicken thigh and drumstick had been separated; they sat in a light and lovely reddish sauce. The plantains provided a touch of sweetness and contrast in texture next to the vegetables and chicken. The overall portion was generous and the flavors melded perfectly! 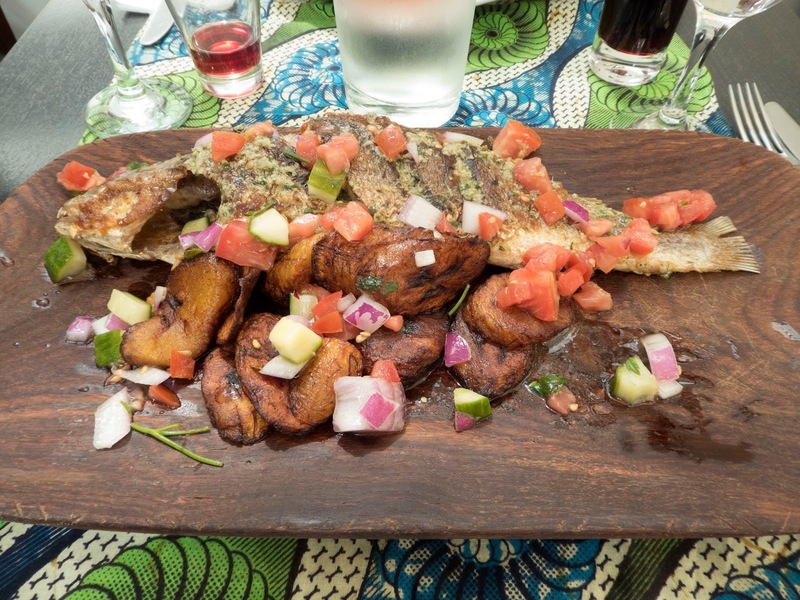 Tom ordered capitaine braisé, which consisted of an entire fish braised with herbs and spices and topped with chopped red onions, diced red bell peppers and zucchini, and steamed plantains, all served on a wood plank. Flavored with citrus, the fish was succulent and tender. He consumed every morsel of this delightful dish! 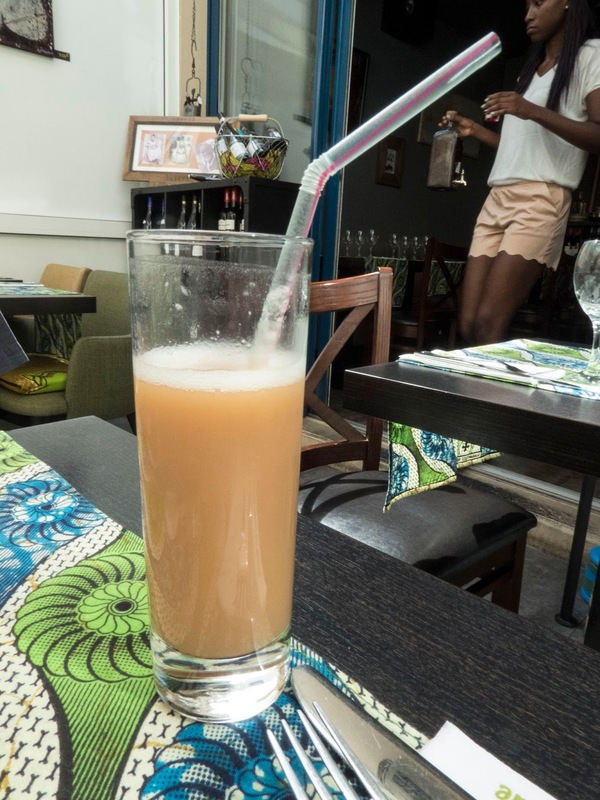 To accompany our meals, I ordered jus de bissap (hibiscus juice) and Tom stuck with his jus de bouille. Given the heat of the day and the fact that we planned to take a long walk after lunch, we did not regret this decision. We both found our selections to be tasty and refreshing. We scrutinized the selections for several minutes before placing our orders. Tom opted for three scoops of ice cream – tarot (a tropical root vegetable), cumbawa (makrut lime), and sesame noir (black sesame). We were surprised at the size of the scoops he received – they were almost twice as large as the scoops we’re used to receiving in French restaurants. Of the three flavors, both of us preferred the black sesame. I ordered one of the suggested prepared desserts – a ginger cake served with crème anglaise flavored with lime zest. A single round cake roughly three inches in diameter and one inch thick was served warm in a bowl. 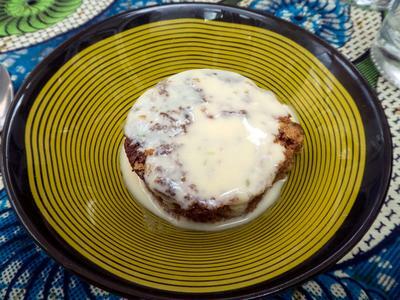 The crème anglaise coated the cake like a thin frosting. Resembling carrot cake, it was moist, tender, and bursting with ginger flavor. I was quite pleased with my choice! The pace of the service was a tad slow but the young women who served us were friendly and kind. About the time we were finishing dessert, Chef Dufy appeared on the terrace to greet his customers and to inquire about their satisfaction with their meals. Tom and I took the opportunity to ask him to pose for a photograph and he graciously did so. 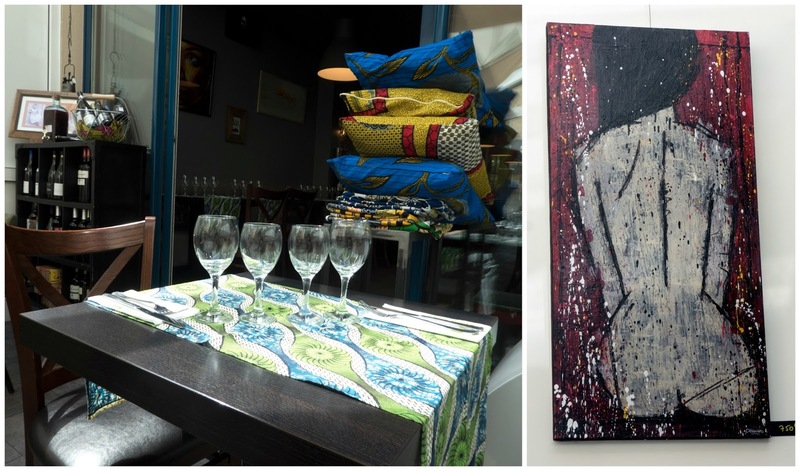 We had an excellent first experience at Ô Petit Club Africain and will happily return!